Last week, I was lucky enough to get to see a screening of Selma before it was released here in the Chicago area. It was quite the experience, and I encourage everyone to get to a theater to see this film. There is a lot that one could say about the film. The acting was great, it has a great soundtrack, and it does an amazing job depicting the events that led to the successful march from Selma to Montgomery in 1965. And it’s incredibly emotional to sit through the movie and allow yourself to be transported back to the Civil Rights Era. 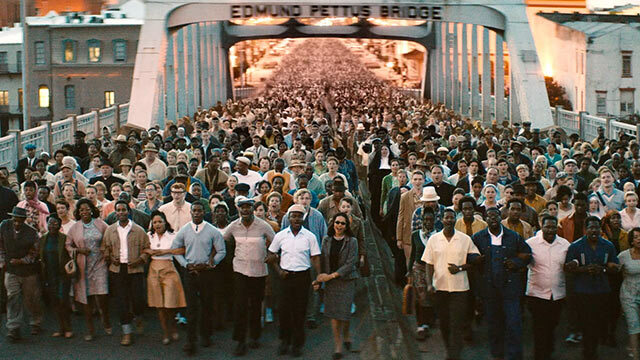 However, I believe it’s impossible to watch Selma and not think about Ferguson. To not think about Eric Garner. To not think about the stories of injustice we’ve been hearing about in recent months. Some of the scenes in the film were eerily similar to scenes that we’ve seen on TV and on the livestreams from protests in Ferguson and around the country. And the words of King are every bit as prophetic for our world today as they were in 1965. Being white, and being a clergy person, this emotionally-charged moment in the film has stuck with me. For, the same could be said today of many white clergy. Many of us have been, and remain, silent. Many of us have not spoken out about injustice and oppression like we should. There are those today who are also calling out for the white clergy to stop being silent. There are many reasons that clergy probably remain silent – or at least aren’t as vocal as perhaps they would like to be. And one of those reasons is probably because many clergy don’t like to offend or upset parishioners. I get that. I really do. I’ve been in ministry for 9 years since seminary, and I’ve certainly had parishioners who have been upset with me at times. But more often than not, those moments and interactions led to positive conversations that allow us to open up to one another, and come away with a greater understanding of where each of us are coming from. It doesn’t mean that we will change our thoughts or views, but there is a sense of respect there. So I guess my hope for myself, and for all other clergy, is that we wouldn’t be held captive by fear (fear of what might happen if we say ______ or what might happen if we say that we’re supportive of ______, etc). I don’t want to be one of those preachers who remains silent on issues of justice, oppression, racism and inequality. That isn’t going to be easy – but it is important. If you’re interested in learning more about Selma and the making of the film, I’d encourage you to read the article, ‘Selma’ and the Long Arc of Justice, written by Ryan Parker. I’m going to close with another section from MLK’s Letter From a Birmingham Jail. It’s certainly an indictment on the church in the 1960s, but I wonder how much of this could be said about the church in 2015 as well…? There was a time when the church was very powerful–in the time when the early Christians rejoiced at being deemed worthy to suffer for what they believed. In those days the church was not merely a thermometer that recorded the ideas and principles of popular opinion; it was a thermostat that transformed the mores of society….Things are different now. So often the contemporary church is a weak, ineffectual voice with an uncertain sound. So often it is an archdefender of the status quo. Far from being disturbed by the presence of the church, the power structure of the average community is consoled by the church’s silent–and often even vocal–sanction of things as they are. Perhaps I have once again been too optimistic. Is organized religion too inextricably bound to the status quo to save our nation and the world? Perhaps I must turn my faith to the inner spiritual church, the church within the church, as the true ekklesia and the hope of the world. But again I am thankful to God that some noble souls from the ranks of organized religion have broken loose from the paralyzing chains of conformity and joined us as active partners in the struggle for freedom. Let us, the church of 2015, be among those noble souls from the ranks of organized religion that break loose from the paralyzing chains of conformity and join our brothers and sisters in the struggle for freedom. Let us not be silent.